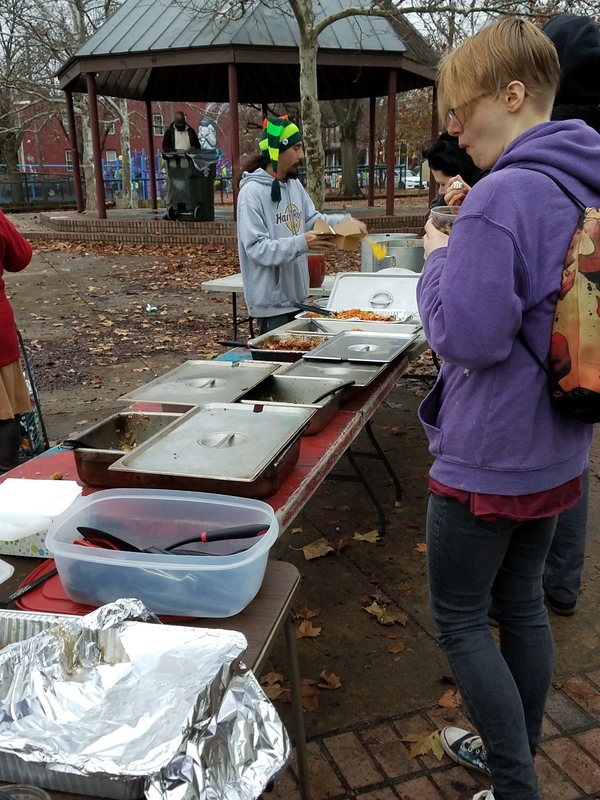 Restricted: Training Involution #136 | Robert Mitchell Jr.
Cabal Fang Temple here in Richmond VA volunteered to assist Food Not Bombs feed the homeless last Sunday. Afterwards we washed dishes. We were too INVOLVED to take pictures of ourselves, and besides, we didn’t want to brag. Here’s a shot of the spread. The other day I posted a video about how restriction breeds creativity while freedom breeds laziness. Don’t believe me? Read the post and watch the video because this week’s involution is based on that premise. Warm-up completely for at least 8:00. Tuck your dominant arm in your belt and do some martial fitness. Set timer for 8:00. Do as many sets of 4 of each exercise as you can before the timer beeps: Jump Squats, Sit-outs, Shrimps, Push-ups (on knees if you can’t do one-arms). Liberate your arm to go to the Heavy bag. 3 x 3:00/1:00 max power shots only. When I say max power, I mean Serena-Williams-from-back-court-for-match-point-with-a-grunt-level power. First round, hands only. Second round, legs only. Final round, all in. Count your strikes in the final round. Write it in your training journal. Beat it next time. Do your Constitutional. Cabal Fang is the only martial art that has a base level fitness requirement. Twice weekly constitutionals are required. Details below. Don’t have a tire? Get one or sub a #20 sandbag and modify — modify, adapt, overcome! What have you done for Spirit Month? Last week I suggested that you volunteer, help out a sick or elderly neighbor or relative, help a friend, etc. Did you do that? If so, you’re off this week on the spiritual portion. If not, restrict yourself somehow until you decide on something and put it on your calendar. Sleep without a pillow, give up soft drinks, beer, TV, your favorite food, etc. Out of ideas? The restriction should help, but ask your deity, higher power or better self for insight. Be still and ask how you can be of service. Listen carefully — something will pop into your head that’s decent and true. Do that.